Classic-Castle.com • View topic - Quest for the "Best Knight"
Quest for the "Best Knight"
Over in the "Lego Sets" subforum, we've been having a discussion regarding what is the "best knight" ever produced by TLG. The debate was good, but one of the main differences in what people thought was "best" was based on whether the old "classic" figs were better, or if the new, more highly detailed parts are superior. This led me to an idea. 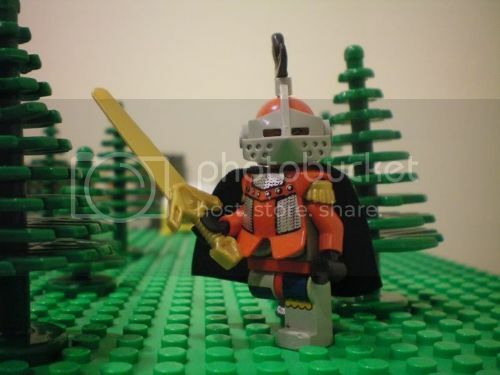 Why not see if we can come up with a "best knight" based off of our own combinations of both new AND old pieces, to make the greatest Lego knight ever assembled? The purpose of this thread: Show us your very best knight combo. Only one knight per post (don't post a whole group of favorites all at once - make the hard choice on which one is truly "best"). Please only post the knight on a plain background. No mounts, bardings, etc. One weapon and a shield are OK. The focus is making the greatest knight of all time. It's not a competition. If someone thinks that they can improve on a combination by someone else, that's perfectly allowed! Also, no custom pieces. Only official, non-modified TLG parts are allowed. Re: Quest for the "Best Knight"
My favourite personal designs are probably Lord Malagram and the Three Shields (check the link in my signature for pics) but yeah, this guy wins. 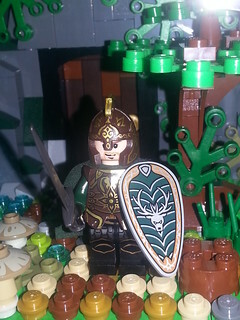 Here's Sir Kejtar - sporting new armour and new helm, with his family crest on the shield.